A very common verse, probably in one of the first groups of verses our Sunday School teachers or camp counselors asked us to memorize. I mean it just fits in so nicely with any topic. I've heard this verse used before in preaching the story of Abraham, the story of David, Daniel... the list goes on. Every time the discussion of the Armor of God comes up there will always be someone to bring up this verse along with it. And that's what's so cool about the Bible... all of the stories mesh together. This guys story, and this woman's story, and that teen's story, and that letter, and that letter, and that gospel... they all form one big story... as if the Bible is God's way of calling out to all of us... we were never meant to be alone. I had been thinking about this verse recently, in a different way than usual, since we just passed the Easter season. Now realistically speaking, he was talking about the sword that peter had just drawn and slashed at one of the guards... but as with most of the phrases Jesus used there are always deeper meanings than what the obvious one was. I began to wonder... are our words swords? Do we use our words to build other people up? Or tear them down? Do our words and phrases that we cling to align with God's Word? If God's word is a double edged sword... are our words little daggers? And when we draw our swords of truth... our swords of the Word of God, is it something we are willing to die for? What about our own words...our little daggers? Are we willing to die for the things we say? All who draw the sword will die by it. Or could it be referencing a different kind of death... a death to ourselves, a surrender of sorts. We hear it all the time about needing to die to ourselves and live for God. We hear all the time of people living for God. Really? We can live FOR God? Are we really able to do that? We can meet God's expectations and requirements? We are able to do anything FOR God? It's little sayings like these that I think lie at the root of the problem of the Christian Church these days. Because these sayings, these phrases we often use without really thinking about begin to sink in to the way we present the Gospel, and worse... they sink in to the way we live our lives. We talk about how totally depraved we were and still are, we talk about our need for a savior, and we speak about knowing God and having a relationship with Him. And how He forgives us and let's us go to Heaven to be with him forever. And I am as guilty as anyone. But the bottom line is, these things we say... aren't really true. We can't live for God. By saying this it brings the attention back to us... as if we are doing God a great favor, or that we are truly living according to all of his standards, of which we can't live up to. When we talk about our walk with God, or how our prayer life is, we categorize. As if our prayer life is a separate part of our lives... prayer is a lifestyle, not a life of it's own. Or that we are just on a walk with God. God shouldn't be walking with us... He should be living inside of us. His will and His word should be directing every move we make. He should be driving us, carrying us, this journey is too long, this path too steep and too rugged for us to be walking. When we say we are getting right with God, it again brings the focus to something we do, as if we can get right with God... we can't. That was the whole purpose of Jesus coming to us... Jesus coming to right us, Jesus coming to make us right with Him... we can't do it alone. And finally, 'I love God'. Well hold on... I do, I really do love God. And doesn't the Bible say we HAVE to love God? Jesus said the most important commandment is to love God with all of our heart, mind, strength and soul. There is nothing wrong with this phrase... if it is truly used. "If you find one who cannot deny himself, but chooses his ways to please himself otherwise than in pleasing God, you may know he does not love God. There will be a perpetual reference to God in all we do. Take the case of a man supremely devoted to his family; he will see everything in the light of its bearing on his family. So a father will do for his children if he supremely loves them. So a husband for his wife; every thing will be referred to the question of the happiness of the loved one. Thus real love to any friend begets spontaneous sympathy with him and with all his interests, and equally spontaneous sympathy against all his enemies." We can't love God... without realizing and recognizing His love for us first. How can we give God what we don't have ourselves? But even if we do know God's love, do we truly love God? Or do we use that phrase ever so loosely? Because when we take words such as 'love' and use it without meaning behind it... we lose something when we talk about the love God has for us. God's Word is a double-edged sword. It penetrates our deepest parts. What if we began living BECAUSE of God? Will we make prayer an everyday part of our relationship with God? Or continue to categorize in our own minds? Will we begin to love God? Truly. And live a life that reflects that change in our hearts and minds? I've come to find in my own life that the only way I can live that change, and live because of everything God has done in spite of my failures and shortcomings is to die to myself. And it's not that I can just die to myself... I need God's help in this too. To die is gain. Complete eradication of me. He didn't say to live is to live for Christ. Paul wrote to the Philippian church, to live IS CHRIST. That's what I want. For life to be Christ. This life that I have been given, to be Christ. Not me. Not what I do for God. But what I do because of God. I want my life to reflect Christ in an and every way. Of the Creator of creation." I want to open up the Bible and allow it to read me, for me to look upon the Word of God and allow it to cut my heart, allow what it says to cut away more of me. To rip...Hmmm... To rip... like Josiah. You can find the full discourse 'On Loving God' by Charles Finney here. The mark, is exactly what I miss. How could you even love me? A slave to what I hate, even when I’m free. The pull of the things of this world… it makes me jealous. But my tendency is to continue going awol. I need your strength, your might, your power. Me by myself… this fight has gone sour. In the end I’m alone, feeling crummy. A lie I continue to believe. I’m never alone, but the pain can deceive. What is this battle all over? Sin and how it creeps even closer. Without it I won’t stay long in this fight. But how? But what? I forgot about your spirit. In you I’ll take refuge… for sure. Sin where are your trappings? It’s the only way I can cope. My praise can only begin with a shout. Today's Simple Sunday post is by a close friend of mine, learning to praise God with our very lives. Today I want to [write about] what has changed my life. And that is simply learning to praise God, to really make Him the focus of my love and attention, above all else. I want to look at Psalm 66 today, while reading I was just floored by it, and can’t wait to share. Make a joyful noise!! I love this so much, and is at the heart of my worship. A simple statement like this, we aren’t asked to worship God in any particular way, with a certain style of music, singing, or praise. He simply wants us to make a joyful noise unto Him. And He wants ALL of us to do this. Our God is great and powerful and deserving of our affections and praise. He should be ahead of all things in our lives, and He deserves all of our praise. We aren’t just worshiping a God who demands it, we are worshiping a God who time and time again has shown us that He deserves it. God has done amazing things for His people, and is utterly deserving of everything we can give. Who are we in comparison? How can we lift ourselves up against God? This is a call to humble ourselves before our God. It is Him that we serve. We also praise our God for all that he has done for us. When we suffered, when we struggled, it was God who rescued us. Even while we were in our sin God loved us so much that He sent Jesus to die for us, and save us. He is bringing us into His presence, because we can’t get there on our own. This Psalm is written while men lived under the law, thus we see listed the sacrifices that were given to God. We are no longer under that law, but we can still sacrifice for Him. What do we cling to in our lives that we should throw upon the alter and be done with? Our God deserves our first and our best, if we are placing anything at all before God, we need to sacrifice it. Give God our praise, for to Him goes all the glory. Think about how we spend our time, for our praise is more than music at church, or a song in our hearts. Our praise is a condition of our heart. We need to place God first in our lives. Do we spend as much time diving into His word, or serving others, as we do watching television, or playing video games? How about our time on facebook? Does it eclipse our time with God? God needs to be first in our lives, and we need to devote our time to Him. If we are spending more time in other areas of our lives, then we are praising those things above Him, we have made idols and we need to break them down and turn back to God. God has done so many amazing things for me, and for you. Are we declaring this the way we should? I won’t speak for individuals, but as a culture I can see clearly that we are not. And I am not even including non-believers in this statement. Of those that call ourselves Christian, the vast majority do not live a life that shows praise to God. I am not sure how this bit on praise turned into such a look into our lives, but I feel the Spirit leading me to say this, and so I will. [Today on] Easter, look inside yourselves, and at the outward image you present. If you don’t know how to answer, or if you know that they don’t. Ask yourself this, what can I sacrifice to the one who gave it all to me? How can I make my life a praise to Him? Focus on the last sentence in these verses. God gave us His son, Jesus Christ, who died and rose again. No longer do we have to worry about making ourselves right with God as the one who wrote this song did. If we surrender to Jesus our very lives, God will hear our prayers, and His mercy is already showering down upon us. Give praise to the God who created us, and to Jesus for rescuing us. God Bless you all. Happy Easter! The King has risen! We've probably heard this word a lot through the years... especially on Palm Sunday. I loved shouting, 'Hosanna! Hosanna! Praise the One who comes in the name of the Lord!' in my children's church classes when I was younger. Yet, for me it seems that the past few Palm Sundays have all been different, there is no consistency in the sermons, always different worship songs (though this may be a good thing), one year we may all receive palm branches, another year just the palm frong crosses, and then other years... nothing, not that we all need palm branches to hold, but there was always something about that day that changed the environment of church as a whole for me. Maybe it was the church tradition that I was raised in, but I always viewed Palm Sunday as a major day in the Christian faith. So I can get disappointed rather quickly when I go to church on that day and no one else is as excited as I am. To me, Palm Sunday is the beginning of the Easter season. Most Christians don't celebrate Lent anymore... it's become more ritual than worshipful... maybe that's why... so I would always begin my celebration of the Easter season when Palm Sunday rolled around. A declaration of palm branch wars was imminent the moment church let out. And you can't tell me the kids back in Jesus' day weren't thinking the same thing as soon as Jesus passed them and went into the temple. It was the entire environment about that day, not just the fun of what seemed like World War 3 and the feeble attempts by parents to stop us, but just how happy everyone seemed to be, everyone getting dressed up even fancier than usual. The Pastor usually reading the full account in one of the Gospels of Jesus riding in. The message of Jesus being praised as the King he is, clearing out the temple and teaching. Always taking a new turn, a new idea from the story. (ie: What was the donkey thinking? What was Jesus thinking? What was God the Father thinking? What would it look like today if Jesus came riding through town, probably sitting in a brand new convertible sports car? but then probably not...) There was always some fun things to think about and discuss... and always leaving with joy unspeakable and conviction of what to do that week to make us more worship filled. The worship songs seemed to always be a collection of my favorites. But then something changed... I don't know what... but Palm Sunday stopped being such a joyous time... and I don't know why. The day is still one of my favorite days of the year, don't get me wrong... however, my ideas of how celebrating the day should be aren't shared by many anymore. I mean this was the day that Jesus entered into Jerusalem as a King. Jesus entered as all of his disciples were praising him, glorifying him, worshiping him on a young donkey. Instead of the church acting like Jesus' followers... it seems like when Palm Sunday comes upon us... we act more like the Pharisees. I know this because just a few years ago, I grew cold to the Easter season too... I had these same thoughts... Easter had gotten old... I didn't want to celebrate. And I wasn't alone. The Pharisees were upset at this grand entrance of Jesus, of course they were... those guys are always mad about something. Honestly I think they were chronically depressed, or just so irritated that they had to wear all of that clothing in the the hot temperatures of Jerusalem that they had to cause misery for someone else just to feel good about something. But they were mad at Jesus again because his followers were worshiping him like the Messiah. They told Jesus to rebuke them. And what did Jesus say in reply? The stones would cry out if we won't. To me this is a rather big statement to make for Jesus to just ride into Jerusalem. I kinda wish to hear the stones cry out... because I guess God would be lucky enough to get even a hand raised when his people 'worship' him now-a-days. My attitude got trampled on by church goers who don't like to celebrate God... and it pulled me into that feeling of complacency. Why don't we worship AS IF the rocks REALLY ARE crying out?! And not just on 'Holy days' but every day? Hosanna! Hosanna! Praise be to the One who comes in the name of the Lord! My reason for this post is not to share my thoughts on how to celebrate Palm Sunday... after all it's just a day... and really this idea of worshiping God should be a whole post by itself... hmmm... :) My purpose for this post is to share my thoughts on what happened 2000 years ago on Palm Sunday...and why it's so important. We say this word a lot, there are worship songs entitled it, sermons mentioning it all the time, we probably heard it at least once yesterday even if your church doesn't get too excited over Palm Sunday. Hosanna... what does it mean? For Christians it has a double meaning... or more of an expanded meaning than it does in it's original Hebrew context. It means 'Save Now!' As a plea. Because we need saving. But for Christians it is a shout of praise, adoration, worship, recognizing Jesus as the savior, the Messiah. Every time we shout the word Hosanna, we are declaring Jesus to be our savior. Because He is. He already has saved us. Two other names of God. In this instance Jesus' disciples are declaring him as the Messiah and yet also declaring him to be God. Praise in the highest... the God Most High. God Most High is sovereign over all, God the King rules everything... he is worthy to be praised. Kids dueling each other with their new tree toys... probably. But they were also laying down their cloaks and coats on the road... on the dirt, the mud, the grime, the stones...the dust. I believe something else was going on here. Adam and Eve sin, and they realize they are naked. God is walking around the Garden asking where they are. They are ashamed to stand before their maker, naked. Even though they were created by him... naked. God covers them with clothing. These people in complete worship to Jesus don't even care... they are ripping off everything extra and praising God... uncovering themselves. Taking off the old and putting on the new. Isn't that what Jesus really came to do? Stripping us of the burdens of the law... fulfilling it in himself so that we could live through HIM instead of regulations and rituals. For those who shouted murderous saying, hate filled words. For those who sat in silence when He needed them most. Jesus' words are truth... He has come into Jerusalem... He has come to us... He has come to take off the old and make us new. Praise God this week... during this Easter season, for doing just that, making us new, alive in Him. I have two other scheduled posts for this week all surrounding the events leading up to Easter. I truly do wish everyone a happy Holy Week, may we all live singing Hosanna to Him who deserves all of our praise! And may the rocks continue to cry out... but may our praise be even louder. One of my favorite worship songs, I thought I'd share. "You really really really really really like Jesus. But if you were honest with yourself, you don’t really want to become like him. You admire his humility, we all do, but do you really want to be that humble? I mean you think it’s beautiful. I think we all think it’s beautiful that the son of God would get down on his knees and wash the feet of his disciples. We think that’s beautiful, but is that really the goal of your life, and is your life headed in that direction of servanthood? You’re thankful that Jesus was spit on, and abused, and that he took it, but you would never let that happen to you. You love the fact that he laid down his rights, but you’re going to spend your life fighting for yours and defending yours. You praise him, you sing songs, and you love him because he loved you enough to suffer his whole time on this earth for your sake, but you’re gonna make sure you have fun while you’re down here, and that you have a good time. In short, you think Jesus is a great savior, but he’s not a great role model…1 John 2:6 says, “Whoever claims to live in him, must walk as Jesus did.” It’s not an optional thing. It’s not this optional thing, ‘Well maybe I can be a Christian and admire everything about Jesus but my life will look nothing like his’. No…whoever claims to have Jesus in him, “must walk as Jesus did”." Do we view Jesus as our role model? In a society, a culture that looks to movie stars, politicians, musicians, and high class businesspeople... do we really search out Jesus? If anybody were to ask you who your role model is, would the first thought be Jesus Christ? Or someone else? I'm certainly not innocent of this attitude. Honestly I see myself putting pastors, christian authors, and my favorite speakers on these high pedestals in my own thoughts... sure it's all about Jesus... but I replace Jesus with these people in order to learn more about Jesus. Why do I do this? It's complete insanity. But if we are honest about ourselves, Why do we all do this in one way or another? It ran rampant throughout Israel... why wouldn't it continue today? Satan knows how to get at us... most times taking a good thing and making it an idol to us. We buy into this all the time. Whose attitude are we seeking? Are we seeking to renew our minds? "You must have the same attitude that Christ Jesus had. Let us truly 'walk with Jesus' this week, in mindset, attitude, love, and thoughts. Seeking a life of humilty. Looking to Christ as our role model. Sometimes I need to sit back and ponder that very question. Who is there like the LORD? Majestic, Holy, Awesome, Glorified, working wonders such as these? Sometimes we all just need to take a break from words and see with our own thoughts. What wonders has God been working in our lives? Love. A word without explanation. A feeling of complete exasperation. For some, Love, is what they've never known. Love, may be what others have only ever been shown. Love is a universal term. But many think about it and squirm. Society. A word filled with philosophy. A system where people get rather comfy. What kind of world, has this place become. That we measure people based on their identity and income. Aren't we all children of the Most High? And yet we choose who is deserving of our time and thoughts, why? God. A word so diverse. A creator seeing His people living directly adverse. As we argue about and reject the Word which he spoke. And it's not that we don't read and listen to what is said. The simple fact of obedience to Him, that's what we dread. World. A word with many definitions. A place with so much noise that no one listens. There is no time for the needy or broken. It's good news after all, Jesus coming to save us. Our lives though, reflect that we are clueless. Love. A word declaring a movement. We claim to know it, but stay dormant. To care for the poor, widows, and orphans? Justice, Mercy, Humility are to cover our actions. 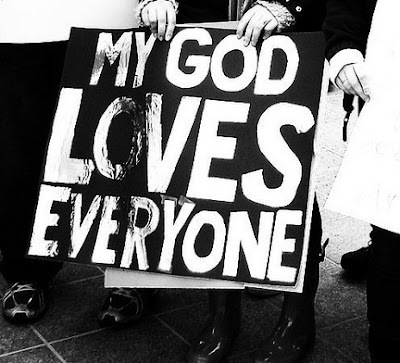 such as 'My God loves everyone'. God has come to call us to be His light. I can see just enough to know we all lost that sight. Our actions need to start pointing upwards. I want the world to think of me, strange. I'm sick of words defining this life. It's time to get out in the field. Living in a world that could care less. I refuse to take part in the oppress. I refuse to keep trying to impress. I refuse to just sit and assess. I refuse to continue to even profess. The church, will come out of it's buildings. Come out of it's judgmental gatherings. Come out of business dealings. Come out of it's briefings. Come out of it's pricey dressings. I want to see the crossings. I can start to see, feel, the blessings. An idea that isn't so absurd. It doesn't need a caption. Just a heart filled with devotion. Is it personal or is it a term you would use to describe someone or something in charge... yet distant? Father is the name God wants us to call him, as we are his children. As we speak to him,he wants us to tell him our heart's desires. He tells us, as a 'father has compassion on his children, so the LORD has compassion on those who fear him'. The word fear means to have a genuine respect of his power and authority, as a father does over us. He shows us his compassion and lovingkindness, grace, and mercy. He is a father to the fatherless. A savior and adopter. Elohim was the name that God was known by when Israel described him to other nations. Full of omnipotence and power. Sovereign. It invokes a fear, or an extreme deep respect... as a father with absolute control, power and might. For us, it invokes a trust. A genuine respect of the power and might of God Almighty... El Shaddai... Elohim. Because we know Him also as a loving Father. Today, we seek another name of God, another description of Elohim. Because we don't have to cower or be terrified by this all powerful father... Elohim has a different name. Maybe you have heard it pronounced...YaHWeH. Maybe you have heard it pronounced...JeHoVaH. Why do I capitalize certain letters? Because the vowels actually do not appear in this name of God. YHWH or JHVH... the Hebrew name of the God who makes covenants. Personally I prefer YHWH. But I'm sure God doesn't mind, either way. We add vowels because without which this name of God is unpronounceable. We steal the vowels from another name of God that is used in conjunction with YHWH a lot... Adonai. The 'ai' is translated from what could be translated into an 'e'. We get A-O-E, skipping the 'O' we get YaHWeH. Using the 'O' and taking the vowels backwards we get JeHoVaH. The letters J and Y can be translated to be the same sound in Hebrew, as well as V and W.
A plural name meaning: Master. A name meaning: Overseer of a slave. First we see another plural name for God... a plurality for one. A picture of the three persons, the three facets, the three pieces of God. But what is this about a master of a slave? If we called him that... would that be us saying, 'Adonai... God, we are your slaves.' ? Because that invokes our choice to serve. But God paid our price. Adonai paid our dowry, our purchase, our slavery has been paid by Him... and those who are bought from slavery are traded... we are slaves of God. Another saying we don't like. Another idea that doesn't sit well. Once we realize all we deserve is slavery. But He is also Father. Going back to that idea of slaves. "Don’t you know that when you offer yourselves to someone as obedient slaves, you are slaves of the one you obey—whether you are slaves to sin, which leads to death, or to obedience, which leads to righteousness? But thanks be to God that, though you used to be slaves to sin, you have come to obey from your heart the pattern of teaching that has now claimed your allegiance. You have been set free from sin and have become slaves to righteousness. Paul talks about it. It's a pretty heavy topic in Romans. So we are slaves of God. But here is where the meaning of YHWH makes this a great thing. YHWH is referred to as the covenant name of God. The God who promises to provide. The God who promises Peace. The God who promises to prevail. The God who promises to be there. But here's the thing, this supreme God, this master, this LORD... is personal. So personal that he makes covenants, promises, and testaments to his people. These are revealed throughout scripture. The word LORD, when spelled with capital letters, stands for the divine name, YHWH, the great tetragrammaton, which is here connected with the verb 'hayah', “to be” or in this case, 'I AM'. He says this to Moses to reinforce the promise he made to him, the covenant that He will be with him as Moses goes to Pharaoh. That is the God we worship. It is the name God repeats as His name as He gives the Ten Commandments to his people. He repeats this name all throughout the Pentateuch. Elijah referenced this name of God as he called fire down from heaven on Mount Carmel. Re-establishing that Israel was God's people and not Baal's. All throughout the Prophets, Psalms, Proverbs, and even Job, the name YaHWeH is used to describe what God is doing and who He is. This great and mighty God wants a personal relationship with us. Finally coming to the point where Jesus, uses this name for himself. The very one who would make the ultimate covenant with all people. Bringing it all back to the name YHWH. God wants all generations to know that this is His name, forever. That the God who makes and keeps promises is still making and keeping promises. He promises us so much that we do not deserve. But that is what makes God so good. He loves. He redeems. He saves. He holds us in His arms and comforts us. What promises in the Bible are speaking to you? God intends to keep those to you. His very name is a promise to us. Ancient Rabbis wouldn't say the word... they viewed it as unpronounceable. Because these sounds... they are the sounds of breathing. Every breath we take... is it possible that our very existence... our very breaths are echoing God's promises. We echo the very name of God. There has been a pastor in the news a lot recently, over a new book he wrote. His name is Rob Bell, and a few years ago he did a series of video teachings with Nooma. Though I personally don't agree with everything he says, I thought one of his videos entitled 'Breathe' would be something good to take in with this post. Are we ready to slow down, meditate on God's promises, every breath we take cries out that God is the God who keeps his promises... That God is LORD, and that God has the power to keep his promises. Nothing can get in his way. Nothing can stop Him from us. And He cares for his people. First off I just want to take this post to show how thankful I am for all of my readers, from those who leave comments, post their thoughts on my facebook or twitter links and even the ones who remain silent. I didn’t really expect to have the opportunity to grow with all of you through this process, but I’m truly, truly grateful for all of it. You guys keep me studying, keep pushing me forward to come up with something cool to write about, and that in itself is more than enough for me to shout a big thank you to all of you. I also want to restate that I would not be able to write any of this if it were not for minds and thoughts from people a whole lot smarter than me. I’m grateful to be the guy that ties two ideas from pastors and theologians into one thought and mixes and mingles my own in between. It’s a community of thoughts, and so I don’t want to take all the credit for everything that is written here. Like this post… or what the rest of this post is going to be about, is heavily inspired by a pastor named Mark Driscoll. But of course, all of the glory goes to God, it’s His word we’re looking at and trying to dig into, it’s His grace that has allowed us to understand and accept, it’s His love that gives us the desire to follow Him. Sometimes we use that word so… loosely. Do we truly know what it means to be glorified or to have something glorified, to see glory? Like a glorified light in the middle of a dark cave. It’s not necessarily that the light is really all that glorious but the simple fact that it’s surroundings glorify it. The darkness… the light pierces. It makes it glorified. off of it makes the light seem so glorious. But what is ‘glory’? It’s one of those words that we know… yet we can’t explain. We say something is glorious when it is dazzling, stands out, or produces something good or pleasing to one of our senses. But what about God’s glory? Does the Glory of God fall under the same system of explanation? Or does it deserve something higher… do we sometimes use the word ‘glory’ too loosely? One of the first instances of the Glory of God is when Moses was standing in the presence of God. A place where we need to take off our shoes. A place where we can’t look at the dazzling brilliance of it. Where our faces begin to glow. Maybe that’s why God is called, ‘the light of the world’… by Him we see everything else. Dictionary.com doesn’t give those as definitions. Over 300 times, God’s glory is mentioned within scripture in various ways. It’s an attribute, an aspect of who God is. Such a small word takes all of those words, phrases, examples, and ideas just to explain… and even after all of that, we are still left without a precise idea of what it is. Maybe that’s what the reaction should be. Maybe that’s what God was getting at. So when we say, ‘all glory to God’ we are taking what, in our minds say should be OUR recognition, and giving it to God… just adding more and more recognition, reflection, power, majesty, awesomeness, to God. The Glory of God was revealed all throughout the Old Testament in ways such as fire and clouds. It illuminates and hides. It leads, and holds back. The Glory of God is the presence of God… which was filling the tabernacle. A sacred meeting place for God to dwell with His people, Israel. It housed the Glory of God… but the purpose was to be showing the whole world. Something like that can’t be contained. The Glory of God was contained. But at the same time was bursting forth, through the seams, shouting, screaming, shining, enlightening, and breaking the silence. God’s glory departed from Israel, the temple, and His people after repeated non-repentant idolatrous, rebellious generations, which defaced and abominated the sanctity of God’s house. God had withheld all of His glory for over 600 years. God did not reveal himself in glory. God did not show forth fire from heaven, or clouds, nor was his presence with His people on Earth. God’s glory came down to be confined in a different temple… a human body. Yet it was still contained. A response to the Glory of God… a celebration. We can’t make God glorious, we respond to His glory, giving Him what is already His. These angels start singing Glory to God in the Highest! Worship is the response to God’s glory revealed. God’s glory has returned, contained in a baby, exploding with angelic praises. The God of glory has come to reveal himself in glory. Jesus reveals his true appearance. While in communion with the Father. And two people show up. Both of these men have had direct experiences with God’s glory. Both have had mountaintop experiences with God's glory and God's voice. Jesus is talking to these two men, one who represents the Law, one who represents the Prophets. And what are they discussing? I have always skimmed over this when I read… I don’t know why. It’s just one of those passages where you feel like you have read it so many times, been taught it in Sunday school or in a sermon and you just ‘know it’. That’s how I have felt about many pieces of scripture… but God has been showing me how little I ‘know it’. What these two men, these two figures, Law and Prophets, are discussing, is Jesus’ departure and what he was going to accomplish in Jerusalem. The Bible is, up to this point only composed of Law and Prophets… and those writings all point to what the Messiah is going to come and do… what He will accomplish. The Bible has just come alive… like for real. The word is living and active. Moses and Elijah are talking to Jesus about Calvary. What Jesus is going to accomplish. Where Jesus is going to go. And I guess he was thinking: Camp Out! He likes John, he likes James, and hey... these other guys are pretty cool. There's plenty of light with this glory thing going on. Why not!? Maybe he wanted to get in on ravens coming to drop food off, like they did for Elijah, Moses striking a stone and making some water, and Jesus multiplying it for the six of them to just chillax on the mountain, away from the crowds. Peter is just one of those characters. And honestly I think he’s a pretty cool guy. Prophets of old. Jesus in absolute glory. Heck yes. Let’s have a party. There is a theological coincidence to His words as well though. And theological coincidences do not exist. Peter says let’s make tents. And then a cloud comes. God’s glory is coming to dwell on this mountain. The tabernacle was a tent. God’s glory engulfed the tent with a cloud. It’s the Old Testament truly coming alive. But it’s also a promise of the New Testament, a New Covenant. God’s glory will never be confined to a tent anymore. Because God’s glory is about to come and dwell with mankind again… Jesus is going to accomplish something new. He’s standing in between the Law and the Prophets, fulfilling them. This is the glory of God, incarnate to dwell with His people, and reconcile all people to Himself. Such a holy, glorious God willing to step out of absolute praise and worship where he sat on a throne surrounded in glory, surrounded in holiness, surrounded in awe, and eminence. Something so mighty, brilliant, that the only we can define it is to respond, react, in complete worship and surrender. As we edge closer to Easter, remember the accomplishing act of Jesus…and the journey. The very Lord of the universe humbled himself for our sakes. He continued to live a life of humility. He died a humble death. What's our reaction to that? The transfiguration of Jesus, in Luke 9, is what prompted the start towards Jerusalem, this explosion of Jesus' true identity was a key moment towards Good Friday. Jesus wants us to know, to reinforce again and again that He truly is God. He’s determined after this transfiguration. The three disciples are determined to keep their mouths shut. God the Father had spoken to them. They not only encountered Jesus transforming, but they heard the very voice of God. The presence of the Father...Why did all three members of the Trinity get involved in this one event? 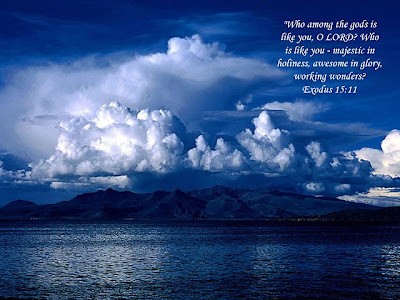 It is my belief that the Holy Spirit was there... the Holy Spirit was in the engulfing cloud. The Holy Spirit prompted the detail of this event as Luke was writing it, based off of the recollection of Peter, James, and John. But why were all three involved? To reinforce God’s glory becoming known… God the Father speaks from the Holy Spirit driven cloud that enveloped them. This defining moment, many theologians would say was the beginning of the Easter story. Jesus' mission was here. His priorities changed. Jesus was coming to redeem sinners. Forgiving our sins. Reconciling us towards Himself. What are the words, the Father chooses to say towards these three disciples? "This is my Son, my Chosen One; listen to him!" Words to live by... for all of His disciples. When we hear that word, we think of one or both of only two things. Because the act and the person are both spelled the same. They weren't meant to be distinguished. The Lord's prayer, is a thing. The Lord's prayer, is a person. So when you pray, remember that you are not only participating in an act of communion with God...talking directly to your creator, but that you are a prayer... a person standing, (or kneeling) in between God and what you are praying for. And when we are praying for others we are standing in between them, their needs, and God. Do we truly have this mindset in our prayers when praying for others? Or do we just say, ' I pray for..._____' ? What does that mean.. we are telling God, that we are praying for someone... though He knows what we mean... do we know what we mean? Are prayer's more powerful, more beneficial when we truly feel God's gracious presence as we speak to Him? Are we specific, do we truly lift up our hearts to God for our friends and families? Allow the following quotes and scripture to help shape how we view our prayer time when we are truly interceding this week. I hope we can all take these quotes and scripture and meditate on the meaning, what God may be telling us through voices of other Christians and His living Word. Are we ready to step up to the plate and truly pray... interceding for others. We need to remember that there are people starving. People dying in mass genocide. Short term missions are popping up all over the place as summer gets closer. Churches are on the move. But we need to be praying for these volunteers, these missionaries to have the right heart, to have the right power behind them, to have the courage, strength, ability, words, thoughts, and needs to do God's will. We need to be those people, even if we are missionaries, or short term volunteers. We need to be praying for our church. Catholics need to be praying for Lutherans. Baptists need to be praying for Methodists. Non-denominationals need to be praying for the traditionalists. And vice versa to all of those. And for those whom I didn't mention. We need to be prayer warriors. I'm going to have a couple posts coming soon highlighting a few mission trips that I have ties to and I hope that we can all be interceding on their behalf... united. To be the City on the Hill that Christ calls us to be... a City on our Knees. I pray that this week, we can 'pray until we can really pray'. What a wonderful promise verse 11 is… stuck right in the middle of that passage. And so many times we pull it out of context. But when do we ever sit and read that promise in the context that Jeremiah meant it to be read? Now don’t get me wrong… God’s word is weird. In the midst of contextual passages we can draw principles and promises ‘out of context’ and it will still be in context with the whole spectrum of scripture. Jeremiah 29:11 can stand alone… and it’s perfectly biblical. But we need to see that it is also directly written for another purpose as well. What other book can you do that with? But for the purpose of this post, I want to shy away from the normative of how God has all these great things in your future… sure it’s true… but I want to look at a different take. God’s good plan is for his people. The exiled people of God who are now in Babylon. His eternal purpose is to dwell in the midst of His people. We can read these words personally and receive encouragement from them… because that’s how God’s Word works. Though the original purpose of Jeremiah’s letter was to Israel… it rings true for us today. This promise of a hope and a future applies to every child of God. He doesn’t save us to be independent, disconnected believers. He saves us, just as one body has many members, and combines all of us into one body. God’s plan has always been to have a people in which He dwells. In this age, all thanks and glory to Christ, we are that people. A local church where you are in relationship, hearing the Word of God proclaimed and preached, rejoicing in the sacraments all with other Christians, other parts of the body, one family. And this church of ours isn’t in a perfectly awesome time. Not with all of the divisions, denominations, sects, heresies, false teaching, incomplete teaching, and cults who claim Christianity. I’d say without any hesitation… we are in the middle of our own Babylon. Very simple… when you get enough people thinking too much about preference, power, prestige, and hoisting one doctrine over the rest… divisions begin. So we can’t read a passage like this and only think of ourselves… God’s Word should always bring us back to Christ… and Christ’s words… to make disciples of all nations. There are too many other people who need to hear and receive Christ for us to ONLY think of ourselves. Sadly I feel people today use a verse such as Jeremiah 29:11 selfishly, for those who find comfort by it, awesome. For those who use it to continue their mind’s, heart’s, and soul’s focus to be upon themselves… what God can and will do for them… that’s where problems lie. I read a book a few months ago entitled, Radical. It’s a VERY good book, written by David Platt, a phenomenal pastor and man of God. I would encourage you to check it out. But the subtitle to the book is what catches my eye for this post… ‘Taking back your faith from the American Dream’. For those of us who are Americans, this should hit us. We live in the most free country in the world, a country that stands upon Liberty, Equality, Justice, and Freedom… and yet we have allowed the culture around us to steal our faith. The one thing that we claim, the devil can never take from us, instead… we allow a system, a ‘dream’, a culture to rip away from us. One of the main things this dream needs in order to achieve is individuality. And we allow it to grasp us and consume us a little too much. Our own sense of independence. Our own sense of self worth. That mindset has hijacked our spirituality. God’s purpose has always been to save a people. We can’t just look to the future and have a hope in plans, thoughts, purposes that are all about us… because God is more interested in people’s lives… not one single perfect life. A people who care about His church, a people who care about what he is doing in the lives of other believers for the benefit of themselves and others. A people who are concerned with our part in His plan. Participation in God’s redemption of the world. Now I’m not taking anything away from the idea that God truly sees us as individuals. God does love us as individuals, he knows each of us by name, he cares for us, he knows every hair upon our head, the thoughts and attitudes of our hearts, everything about us individually. We aren’t just some number in this giant plan… he knows us. Perfectly. Honestly. Wholly. Jesus taught about the good shepherd running after the one sheep, leaving the flock. Jesus taught that God rejoices when one sinner repents than over 99 who are already saved. But when it comes to living this new resurrection life we’ve been given… the focus never was, never is, never will be… about us. And when we read God’s promises we need to keep this in mind. God’s plan is for everyone. Because God can create a plan big enough to encompass everyone. It’s all about seeking God…with all of our heart. And notice this… it’s part of the character of God. He does all of that BEFORE he requires anything of us. His plan is always to move first. His plan is to always be one step ahead of us… we never have to wait on God to meet our needs, because his plan is always for Him to be our provider and our savior. It was the same in Egypt. He brought His people up out of Egypt… THEN he gave the Ten Commandments. He broke the silence by coming down to Earth to save us… THEN he calls us to trust Him and repent. And He is coming back again to ‘gather you from all the nations’ gather US from all the nations, and ‘bring you back to the place from which I carried you into exile’ bring us back to the place where he sent us into exile. God never sent us into exile. Jeremiah is talking about the people in Babylon. God is talking about all people. Babylon is east of where the Israelites are supposed to be. And God wants to bring them back. Humanity is still in exile from paradise. Humanity is still separated from where we were meant to be. God is showing signs of bringing back all of His people… back to an Eden of sorts. Our tree of life is actually the bread of life. Our Eden is actually heaven. Our Adam is actually Christ. God is speaking of his people. God is saying, I know the plans I have for you… it’s all the same plan. And it’s something you can hope for. It’s something still in your future. And it’s definitely not going to harm you, and it’s definitely going to prosper you. In the meantime, we have the church. We have each other. Let us work to be the people God is interested in dwelling with…because the truth is He is dwelling with us. Everyone of us houses God the Holy Spirit... let us be unified then. Love is the solution. Knowing what we believe and why is the power. Dig into your Bible. It is our road map in the midst of this journey.